I've mentioned this on a few occasions that my boy Hudson is not a big fan of vegetables. But cauliflower, that he will eat, devour, and ask for more. So basically, we eat cauliflower, broccoli and brussels sprouts 3-4 times a week. And as much as I love those vegetables, I really do, eating them as often as we do can grow tiresome. So I basically spend my mornings searching through pinterest pinning every cauliflower recipe I can find to get some new recipe ideas. I ran across this recipe in one of my health magazines and immediately tore it out. Beer, hot sauce, cauliflower, tacos, whats not to love! The recipe takes about 40 minutes to make and is incredibly good. The cauliflower first get simmered in beer (yes! ), lime juice and hot sauce, with a little broth and lots of garlic. Then tossed together with cumin, chili powder, and paprika. Roasted until browned and slightly crisped. We ate them with a simple cabbage slaw underneath and lots of spicy mayo on top. They would be incredible with avocado...and grilled shrimp! Or skip the tortillas and make spicy cauliflower beer nachos! In a saucepan, add beer, broth, lime juice, hot sauce and garlic over medium heat. Add cauliflower and simmer for 3 minutes. Remove from the heat and drain all the liquid. In a small bowl, combine chili powder, smoked paprika, cumin, garlic powder and salt. Place cauliflower and onions in cast iron pan. Add spice mix and thoroughly toss together with your hands. Bake for 30 minutes, tossing once. Mix lime juice, vinegar, oil, salt and thinly sliced cabbage in a medium bowl. Top with cilantro and combine gently. Thoroughly mix together. Add a pinch of salt and pepper if you like. Heat pan over medium high heat. Add tortillas, my pan fits 2, and cook for 1-2 minutes per side, until golden and hot. 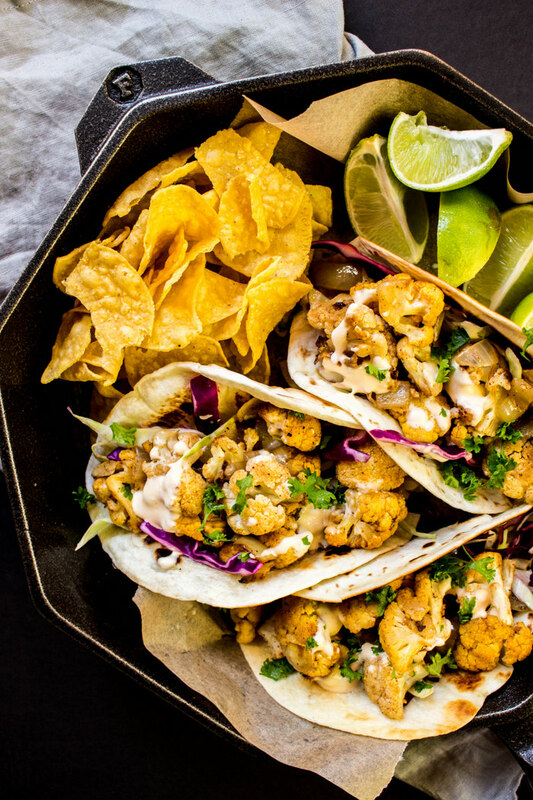 Remove tortillas, add cabbage slaw, then top with spicy cauliflower and spicy mayo. Avocados would be excellent on top as well. This post was sponsored by FINEX, the coolest cast iron pan I ever did see.